Saison is a style that's much loved at Crafty Towers, one that's a favourite of many brewers and also a beer that chefs and sommeliers like to work with due to its subtle complexities. It's also a style that is seen a little more each year in Australia, both in terms of straightforward interpretations and those that add spices, barrels, fruits and wild yeasts and bacteria to the mix. We've always felt that it's a style ideally suited to Australian climes, certainly in the warmer months, as it's typically refreshing, lively on the palate and should finish dry as you like. Yet we also hear that it's a beer that can move slower than others in a brewer's range, presumably at least partly because saisons don't traditionally put punchy hops front and centre and instead rely on the unique characteristics of their yeasts to hog the limelight. In the past year or two, the rise of sour beers has possibly eaten into the part of the market where saisons reside too; on the flip side, with Bridge Road's Chevalier Saison becoming the first local take on the style to be ranged in Dan Murphy's nationally, the phenomenon that is Hawkers having a saison in its core range and much fancied breweries like La Sirène and Boatrocker releasing various versions, one suspects the momentum is there for it to continue to expand its niche. It's three-and-a-half years now – back in the earliest days of our blind tastings – since we featured saisons. So, with the warmer weather (allegedly) on its way, we figured it was time to revisit the style. 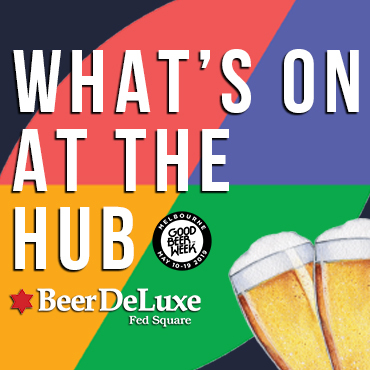 We managed to line up ten local versions – omitting anything featuring non-traditional ingredients (except Nomad's Long Trip Saison as it's reigning CBIA Champion French / Belgian Style Ale) – and added a couple of renowned internationals as benchmarks. It wasn't possible to get them all from retail (our preferred method) so some came direct from brewers, as indicated below. There were a couple of beers brewers were unable to get to us, although the blame for Black Hops' Beach House not making it lies fairly and squarely with Australia Post who, four days after the bottles entered their system for one day delivery, had no idea where in the country they were... And, shame on Crafty, we realised when writing up these results that one beer that was sent successfully by a local brewer remains in one of our beer fridges untasted; we're endeavouring to pull together as much of the panel again this week to taste it blind so we can at least provide feedback to the brewer. The full methodology by which our panel of six judged the beers can be read here. There was one slight difference this time: given saison can be a relatively broad church and not a style that all of us drink with regularity, we tasted a classic international version first – not knowing what it was – to see how the panel's scoring was aligned before launching into the main taste test. You can read our resident beer scholar's article on the style historically then and now, or get straight into the results below. 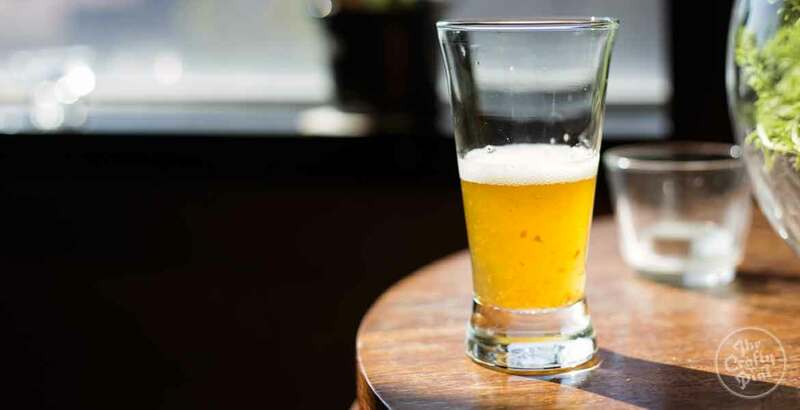 As stated above, saisons are a relatively broad church; read the style guidelines and, while there are certain key aspects that should be there: high carbonation and a very dry finish for example, there's plenty of scope for brewers to play around. During one flight of three, in which all the beers had plenty going on yet in vastly different ways, we started to suspect that there could be some wildly disparate scores and opinions. Yet, aside from a handful of outlier scores, there was pretty solid consensus on the beers, certainly for those that scored best. Sadly, the Fantôme that was included was infected – unless the aim with that particular bottle had been to create an uncarbonated, barrel-aged sour cider. As for the St Feuillien that was the "calibrator" before the main judging started, if it hadn't been for the large lumps floating around in the beer (see photo at top), it would have challenged for top spot as, appearance aside, it offered everything you could want in a classic saison. The other classic saison in the mix was, of course, Dupont. And the question hanging over the tasting was, to an extent, could a local beer get close to its majesty? And the answer was: "Yes." Indeed, one local beer managed to beat it to top spot, with the top two (and St Feuillien) finishing some distance ahead of the pack. Matt Houghton of Boatrocker has long professed his love of Belgian style beers and, when it was first released, described his Saison du Bateau as a "line and length" take on the style. If our panel's thoughts are anything to go by, it's a Glenn McGrath-esque line and length. Quite where this "win" ranks alongside Boatrocker's 2015 Champion Small Brewery title or four straight Good Beer Week Gala Showcase People's Choice titles remains to be seen. But, with judges commenting on its "super dry finish", "smooth mouthfeel", "juicy aromas", "great carbonation level" and "beautiful white head" – and in a lineup containing several current or past trophy and gold medal winners, such as Australian Brewery's Saison D'Heretique, Bridge Road's Chevalier Saison, La Sirene's Saison and Nomad's aforementioned Long Trip – du Bateau has much to recommend it. Please note that the Boatrocker beer tasted was from bottles featuring packaging that is being phased out. The beer now has a new look, which you can check out here. We managed to pull together four of of the six panellists to taste the two missing beers in a blind setting. They were Morrison Brewery Saison and Black Hops Beach House Saison (with Brooklyn's Sorachi Ace added to make it another flight of three). We were keen to include them not just because the former had been left in the fridge and the latter held up by Aus Post, but also as we rate both: Morrison's we poured at our Good Beer Week Crafty Cabal Sunday Session; Beach House is the Black Hops beer chosen for the site's founder's latest book. 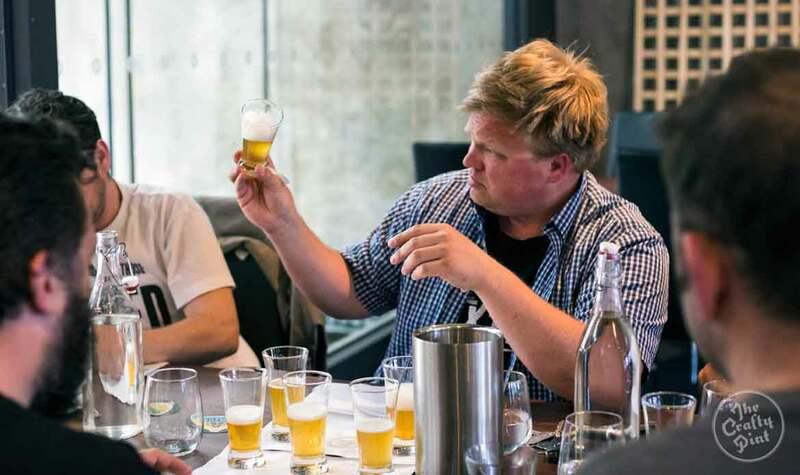 While it's not an exact like-for-like – the venue and glassware were different, for example – it was still four of the original six palates tasting the beers blind. And we're glad we did as Morrison's score would have placed it top three and Beach House top five. So, if you like saisons, when in Tassie look out for the former and, in Queensland, the latter! Thanks again to a slimline Prof Pilsner and sidekick Kerry McBride for stewarding and to Temple for hosting once more.